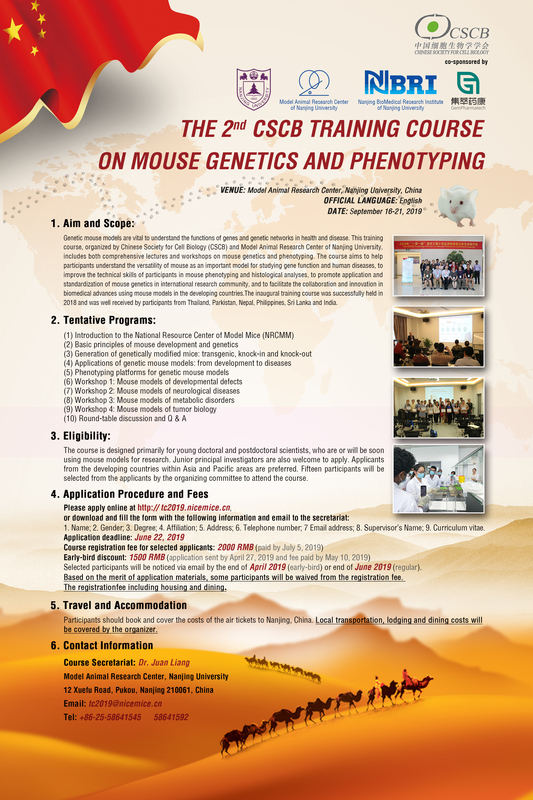 The Chinese society for cell biology (CSCB) and the Model animal research center of Nanjing University in China are co-organizing a training course on mouse genetics and phenotyping this coming September. This training course is a part of the efforts on the "One belt one road" initiative, aims to help participants understand the versatility of mouse as an important model for studying gene function and human diseases, to improve the technical skills of participants in mouse phenotyping and histological analyses, to promote application and standardization of mouse genetics in international research community, and to facilitate the collaboration and innovation in biomedical advances using mouse models in the "One belt one road" initiative countries. The inaugural training course was successfully held in 2018 and was well received by participants from Thailand, Parkistan, Nepal, Philippines, Sri Lanka and India. We encourage graduate students, post-docs and early-career principal investigators from your department to apply. The deadlines for early bird and regular applications are April 27 and June 22, 2019 respectively. Based on the merit of application materials, some participants will be waived from the registration fee. You can find more detailed information from the attached poster or the course website (tc2019.nicemice.cn). Please feel free to contact me if you have questions or comments.